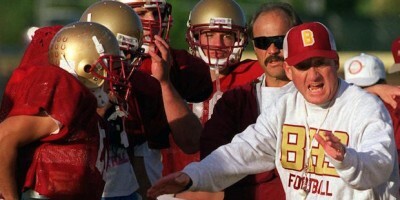 Dave Hunter with his Brookwood team. The Georgia Athletic Coaches Association will hold a celebration in Dalton on Saturday to induct four new members into the GACA Hall of Fame. The inductees for the 2018 class are longtime Vidalia girls basketball coach Charles “Chunk” Reid, former Wheeler baseball coach David McDonald, Henry County wrestling coach Marty Hutsell and longtime Brookwood football coach and athletics director Dave Hunter. The GACA Hall began in 2001 with football head coaches Wright Bazemore, Dan Pitts and Bill Chappell and basketball head coach D.B. Carroll in the first class of inductees. In all, 92 members have been inducted. The event, which will take place at the Dalton Convention Center, will be a family affair for all the inductees, especially Hunter, who has a long list of invitees that will travel to Dalton this weekend. Dyer, the current Archer head coach who played and then coached for Hunter, joins the list of former players who have later worked alongside their former coach. Several will be in attendance to honor Hunter. “I invited Phillip Jones, the current Brookwood coach and Tommy Jones as well,” he said. “Those two boys played for me and coached for me. Their daddy was one of my line coaches for years. Tommy was a captain with Andy in 1991 and Phillip played in 1996 when we won the state championship. The list doesn’t stop there. Hunter, whose memory of everyone who worked alongside him is as crisp as ever, dug deep with his invites. Digging even further back, Hunter, ever grateful, invited the man who hired him at Brookwood with hopes that the invite would be accepted. But being so long ago, he wasn’t sure. The response was unexpected and overly welcomed. Hunter, the executive director of the Corky Kell Classic, which will be going into its 27th season in 2018, coached for 26 seasons in Georgia, beginning his career in 1976 at Peachtree High School. 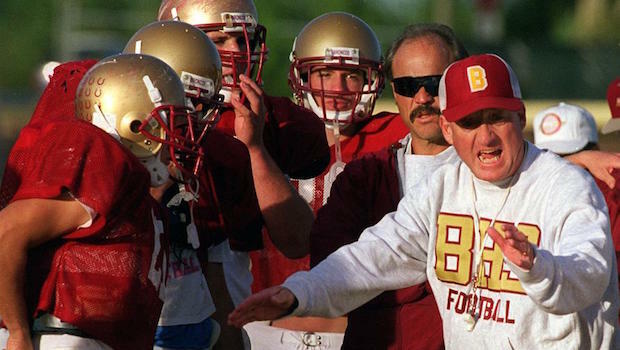 He rose to prominence as the head coach at Brookwood from 1987-2001. Hunter compiled a 176-52-1 record in his career with a 149-36 record at Brookwood. The highlight was a 45-24 victory over Valdosta in the 1996 Class AAAA State Championship to cap off a 13-2 season for the Broncos. If there ever was a perfect example of a coach deserving to be honored in the GACA Hall of Fame, Hunter fits the bill. The GACA Hall of Fame highlights certain coaches, across numerous sports, who have left a legacy across the state. Opened in 2000 at the Dalton Convention Center, the Hall of Fame features bronze plaques, two feet tall and a foot wide, one for each inductee. Following this year’s induction class, there will be 101 impressive plaques on display at a cost of more than $4,000 dollars each. “We have 101 coaches in the Hall of Fame,” said GACA Executive Director Bobby McAllister, who has been at the helm of the Association for two years. McAllister coached football for 24 seasons in Georgia, compiling a 117-137 record from 1974 to 2004. He coached at Telfair, Troup, Oglethorpe, Worth, Franklin and Emmanuel County Institute throughout his career. When reflecting on the members of the Hall of Fame, McAllister’s thoughts went immediately to the diversity of the coaches who have been inducted, representing numerous sports. The Hall of Fame ceremony will cover two days of events in northwest Georgia beginning with a golf tournament at 10 a.m. on Friday at Fields Ferry Golf Course in Calhoun. For the ladies who might not be participating in the tournament, there is a luncheon at noon on Friday at the Dalton Convention Center. On Friday evening there is a reception for the inductees at the Dalton Convention Center beginning at 7 p.m. On Saturday, the induction banquet will begin at 11:30 a.m. at the Dalton Convention Center.